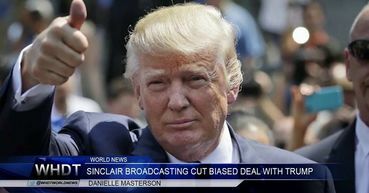 The Sinclair Broadcasting cut a biased deal with Jared Kushner and the Trump campaign. Now the Trump FCC is paying back the favor. A humorous look at how dangerous this company will be for people's opinion. Thanks for that link, Peggy. We certainly need laughs when we deal with the news! Near the end of the video, John Oliver suggests that we look up our local stations to see if Tribune owned any of them. Sure enough, here in Omaha Tribune, and now Sinclair, owns KPTM, Fox 42. Also, KXVO, aka the CW (Warner Bros./CBS) is now run by Sinclair as well., by a licensing agreement. I"ve never liked hardly any programs on those two, so I haven't watched them. They're probably worse now.